Smooth-Cast® 385 Product Information | Smooth-On, Inc.
Shrinkage 0.0006 in. / in. 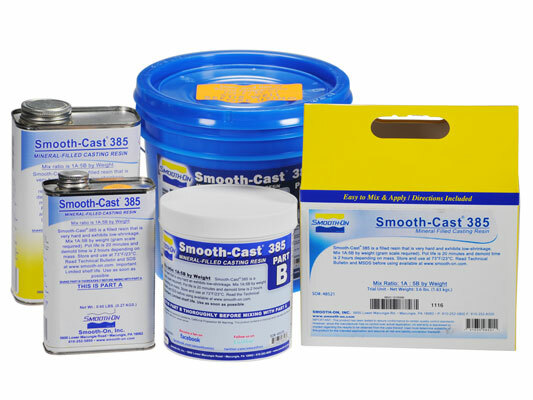 Smooth-Cast® 385 is a mineral filled urethane casting resin that is very hard and durable. When Parts A and B are mixed in proper proportion (1A:5B by weight), Smooth-Cast® 385 cures at room temperature with virtually no shrinkage. This rigid urethane casting resin has high compressive and flexural strength. 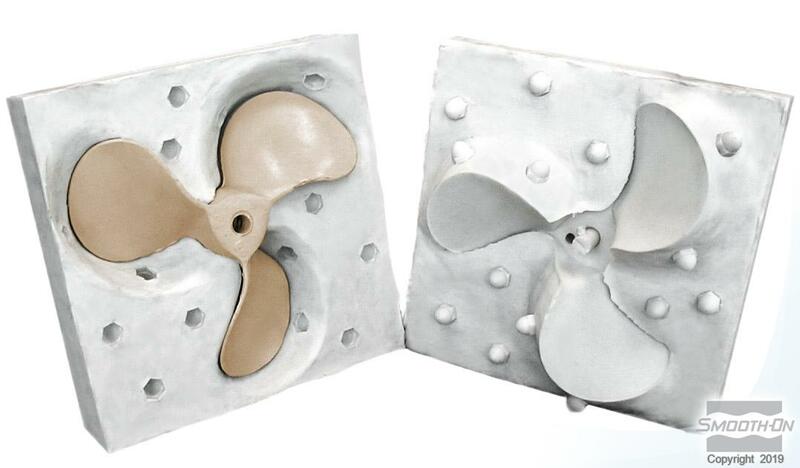 Fully cured castings are tough, machinable and paintable. Mixing - PRE-MIX PART-B BEFORE YOU BEGIN. After pre-mixing Part-B, dispense required amounts of Parts A and B into mixing container and mix thoroughly. Stir slowly and deliberately, making sure that you scrape the sides and bottom of the mixing container several times. If Vacuum Degassing subject mixture to 29 inches mercury for 3 minutes or until mixture rises and falls. Post Curing - Although not necessary, post curing will increase physical properties and material performance. 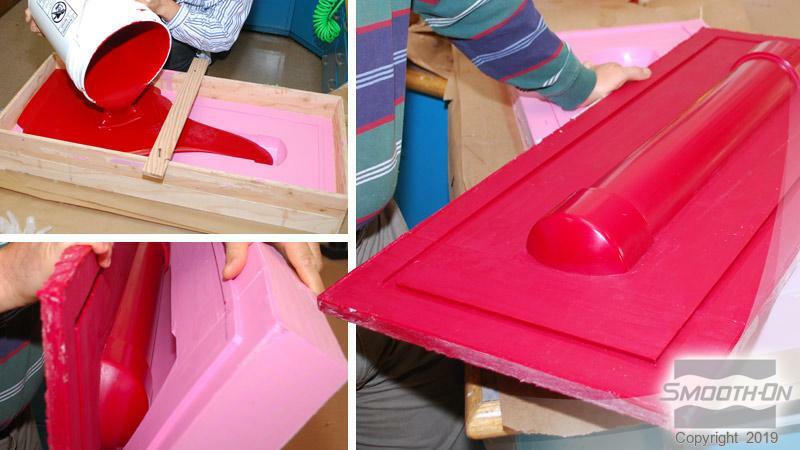 If using SC 385 as a vacuum form mold, post curing is recommended. After curing at room temperature, expose material in the mold to 150°F/65°C for 4 – 6 hours. Let cool to room temperature before use. Performance - Cured castings of SC 385 are very hard and durable. They resist moisture, moderate heat, solvents, dilute acids and can be machined, primed/ painted or bonded to other surfaces (any release agent must be removed). If machining castings, wear dust mask or other apparatus to prevent inhalation of residual particles. Castings can be displayed outdoors after priming and painting. 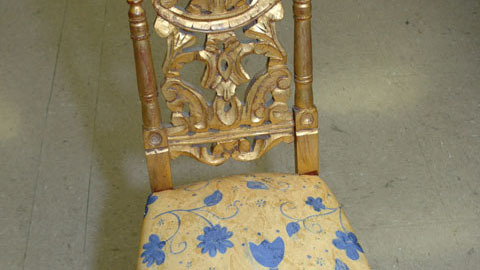 Unpainted castings will darken after being exposed to UV light. Because no two applications are the same, a small test application to determine suitability is recommended if performance of this material is in question.